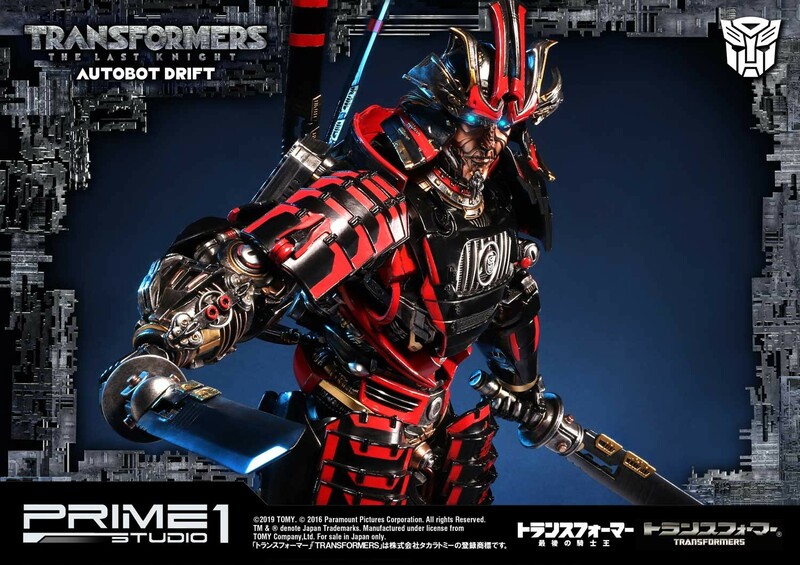 On Prime 1 Studio's Facebook page, we have a full gallery of their upcoming statue, The Last Knight Drift, ID'd as MMTFM-22. Check out the full gallery of the toy on their Facebook page here, or by clicking the image below. We have also have the product description below, which includes it's accessories, and it's dimensions. If you like what you see, well, we also may feel bad for your wallet. But tell us your thoughts in the Pub forums below, and your thoughts on such statues in general! "No pain. No anger. No hate.” Prime 1 Studio is proud to present MMTFM-22: Autobot Drift from The Transformers: The Last Knight. 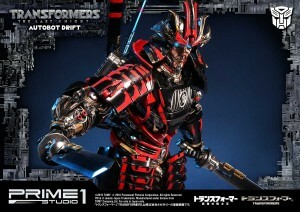 Autobot Drift also known as Master Swordsman is a true martial artist in combat. Against his enemies, he wields legendary warrior skills with a mastery no one can match. He remains cool and collected in the heat of battle by channeling ancient samurai discipline. When the exact moment arrives to attack, he draws his razor sharp sword to strike down Decepticons in a fraction of a second. He is a supporting character in the 2014 movie, Transformers: Age of Extinction and its sequel Transformers: The Last Knight. Autobot Drift comes with two set of arms to give a different look of the Masterful Autobot Swordsman. [Product Specifications] - Size approximately 23 inches tall [(H)58.3cm (W)45.5cm (D)36.5cm] - Size approximately with swords equipped [(H)58.3cm (W)53.7cm (D)52.8cm] - One (1) designed theme base - LED Light-up function on Head - One (1) set of arms Greeting gesture - One (1) set of arms holding swords [Notice] Prototype samples are shown. Product details could be subjected to change without further notice. That Drift is pretty damn awesome. And it's further proof that only high-end non-transforming figures can truly give the movie designs justice. -Kanrabat- wrote: That Drift is pretty damn awesome. But they are wrong. Because only TRUE 100% accuracy for the bot mode can only be achieved with a statue / figure. Yes, but that's not the point of the statue. The statue don't mean interaction. It only serve for the perfect look. Both serve different purposes. Thus it's like comparing apple and orange. 5,629 pages were recently viewed by 900 unique visitors. This page was viewed 1 times on Saturday, April 20th 2019 9:50am CDT. © 2019 Seibertron, Inc. DBA Seibertron.com. All Rights Reserved. Established June 2000. Seibertron.com is owned by Ryan Yzquierdo.